Replica Sets or Sharded Clusters? ** Diagrams updated on May 22nd. Thanks to Leif Walsh from Tokutek for his feedback. Replica Sets are a great way to replicate MongoDB data across multiple servers and have the database automatically failover in case of server failure. Read workloads can be scaled by having clients directly connect to secondary instances. Note that master/slave MongoDB replication is not the same thing as a Replica Set, and does not have automatic failover. Since replication is asynchronous, the data on secondary instances might not be the latest. Sharding is a way to split data across multiple servers. In a MongoDB Sharded Cluster, the database will handle distribution of the data and dynamically load-balance queries. So, if you have a high write workload, then sharding is the way to go. MongoDB uses a shard key to split collections and migrate the ‘chunks’ to the correct shard. It is important to pick a good shard key and avoid “hot spots”, so that data is evenly spread between shards and writes are also evenly distributed. In the picture below you see an example with two shards, each shard consists of a replica set. Migration from a Replica Set to a Sharded setup is pretty easy, but should not be done when the system is busy. The splitting/migration of chunks creates extra load, and can bring a busy system to a standstill. Additional configuration and routing processes are added to manage the data and query distribution. Config servers store the meta data for the sharded cluster, and are kept consistent by using a two phase commit. Routers are the processes that clients connect to, and queries are then routed to the appropriate shard. Sharding does add some more complexity, since there are more processes to manage. However, if your performance is degrading and tuning of your application or your existing instances are not helping, then you probably need to look into sharding. 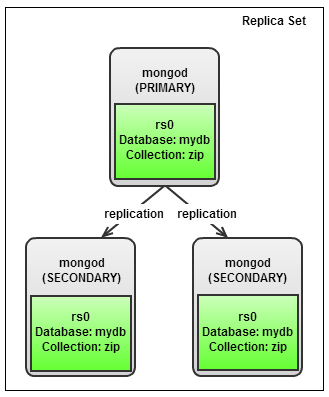 At the moment, we have a replica set (rs0) with a database (mydb) and a collection (zip) on 3 servers (mongo1, mongo2,mongo3). In a Sharded Cluster, another 2 new roles will be added: mongos and mongod config. 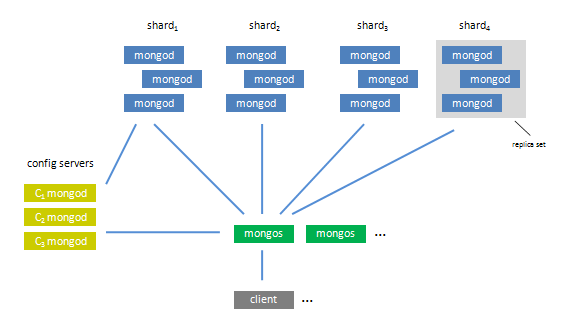 mongos is a routing service for MongoDB Sharded Clusters, it determines the location of the data in the cluster, and forwards operations to the right shard. 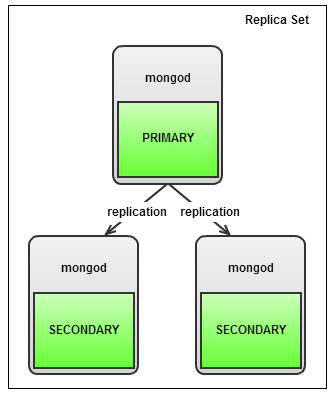 mongos requires mongod config, which stores the metadata of the cluster. All mongos instances must specify the mongod config hosts to the --configdb setting in the same order, and the mongos will read from the first config server (if it cannot connect to the config server, it will move on to the next on the list). Previously, our mongod replication instance listened on TCP port 27017. We are going to change this to listen to another port (27018) since mongos will take over port 27017 to serve queries from clients. mongod config will use port 27019 to serve the cluster metadata. Now, our replica set (rs0) is running as a shard in our Sharded Cluster. Congratulations, you have now converted your MongoDB replica set into replicated Sharded Cluster! To add monitoring and cluster management to your Sharded Cluster, you can follow this post to install ClusterControl for MongoDB.